The Salvation of the ‘Little Ones’: Do Infants who Die Go to Heaven? The death of an infant or young child is profoundly heartbreaking – perhaps the greatest grief a parent is called to bear. For Christian parents, there is the sure knowledge that our sovereign and merciful God is in control, but there is also a pressing question: Is our baby in heaven? This is a natural and unavoidable question, calling for our most careful and faithful biblical study and theological reflection. The unspeakable anguish of a parents heart demands our honest and humble searching of the Scriptures. Some are quick to answer this question out of sentimentality. 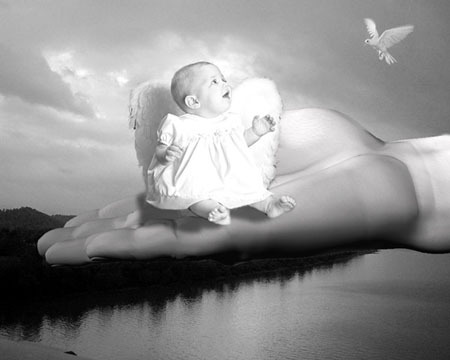 Of course infants go to heaven, they argue, for how could God refuse a precious little one? The Universalist has a quick answer, for he believes that everyone will go to heaven. Some persons may simply suggest that elect infants go to heaven, while the non-elect do not, and must suffer endless punishment. Each of these easy answers is unsatisfactory. Mere sentimentalism ignores the Bibles teaching which bears on the issue. We have no right to establish doctrine on the basis of what we hope may be true. We must draw our answers from what the Bible reveals to be true. Universalism is an unbiblical heresy. The Bible clearly teaches that we are born in sin and that God will not tolerate sinners. God has made one absolute and definitive provision for our salvation through the substitutionary atonement accomplished by Jesus Christ our Lord. Salvation comes to those who believe on His name and confess him as Savior. The Bible teaches a dual destiny for the human race. The redeemed – those who are in Christ – will be raised to eternal life with the Father in Heaven. Those who have not believed in Christ and confessed Him as Lord will suffer eternal punishment in the fires of Hell. Universalism is a dangerous and unbiblical teaching. It offers a false promise and denies the Gospel. The Bible reveals that we are born marked by original sin, and thus we cannot claim that infants are born in a state of innocence. Any biblical answer to the question of infant salvation must start from the understanding that infants are born with a sin nature. The shifting of the focus to election actually avoids answering the question. We must do better, and look more closely at the issues at stake. Throughout the centuries, the church has offered several different answers to this question. In the early church, Ambrose believed that baptized infants went to heaven, while unbaptized infants did not, though they received immunity from the pains of hell. His first error was believing in infant baptism, and thus in baptismal regeneration. Baptism does not save, and it is reserved for believers – not for infants. His second error was his indulgence in speculation. Scripture does not teach such a half-way position which denies infants admission to heaven, but saves them from the peril of hell. Augustine, the great theologian of the fourth century, basically agreed with Ambrose, and shared his understanding of infant baptism. Others have taught that infants will have an opportunity to come to Christ after death. This position was held by Gregory of Nyssa, and is growing among many contemporary theologians, who claim that all, regardless of age, will have a post-mortem opportunity to confess Christ as Savior. The problem with this position is that Scripture teaches no such post-mortem opportunity. It is a figment of a theologians imagination, and must be rejected. Those who divide infants into the elect and non-elect seek to affirm the clear and undeniable doctrine of divine election. The Bible teaches that God elects persons to salvation from eternity, and that our salvation is all of grace. At first glance, this position appears impregnable in relation to the issue of infant salvation – a simple statement of the obvious. A second glance, however, reveals a significant evasion. What if all who die in infancy are among the elect? Do we have a biblical basis for believing that all persons who die in infancy are among the elect? We believe that Scripture does indeed teach that all persons who die in infancy are among the elect. This must not be based only in our hope that it is true, but in a careful reading of the Bible. We start with the biblical affirmations we have noted already. First, the Bible reveals that we are “brought forth in iniquity,”(1) and thus bear the stain of original sin from the moment of our conception. Thus, we face squarely the sin problem. Second, we acknowledge that God is absolutely sovereign in salvation. We do not deserve salvation, and can do nothing to earn our salvation, and thus it is all of grace. Further we understand that our salvation is established by Gods election of sinners to salvation through Christ. Third, we affirm that Scripture teaches that Jesus Christ is the sole and sufficient Savior, and that salvation comes only on the basis of His blood atonement. Fourth, we affirm that the Bible teaches a dual eternal destiny – the redeemed to Heaven, the unredeemed to Hell. What, then is our basis for claiming that all those who die in infancy are among the elect? First, the Bible teaches that we are to be judged on the basis of our deeds committed “in the body.”(2) That is, we will face the judgment seat of Christ and be judged, not on the basis of original sin, but for our sins committed during our own lifetimes. Each will answer “according to what he has done,”(3) and not for the sin of Adam. The imputation of Adams sin and guilt explains our inability to respond to God without regeneration, but the Bible does not teach that we will answer for Adams sin. We will answer for our own. But what about infants? Have those who die in infancy committed such sins in the body? We believe not. One biblical text is particularly helpful at this point. After the children of Israel rebelled against God in the wilderness, God sentenced that generation to die in the wilderness after forty years of wandering. “Not one of these men, this evil generation, shall see the good land which I swore to give your fathers.”(4) But this was not all. God specifically exempted young children and infants from this sentence, and even explained why He did so: “Moreover, your little ones who you said would become prey, and your sons, who this day have no knowledge of good and evil, shall enter there, and I will give it to them and they shall possess it.”(5) The key issue here is that God specifically exempted from the judgment those who “have no knowledge of good or evil” because of their age. These “little ones” would inherit the Promised Land, and would not be judged on the basis of their fathers sins. John Newton, the great minister who wrote the hymn Amazing Grace was certain of this truth. He wrote to close friends who had lost a young child: “I hope you are both well reconciled to the death of your child. I cannot be sorry for the death of infants. How many storms do they escape! Nor can I doubt, in my private judgment, that they are included in the election of grace.”(6) The great Princeton theologians Charles Hodge and B. B. Warfield held the same position. Jesus instructed his disciples that they should “Permit the children to come to Me; do not hinder them; for the Kingdom of God belongs to such as these.”(8) We believe that our Lord graciously and freely received all those who die in infancy – not on the basis of their innocence or worthiness – but by his grace, made theirs through the atonement He purchased on the cross. When we look into the grave of one of these little ones, we do not place our hope and trust in the false promises of an unbiblical theology, in the instability of sentimentalism, in the cold analysis of human logic, nor in the cowardly refuge of ambiguity. We place our faith in Christ, and trust Him to be faithful to his Word. We claim the promises of the Scriptures and the assurance of the grace of our Lord. We know that heaven will be filled with those who never grew to maturity on earth, but in heaven will greet us completed in Christ. Let us resolve by grace to meet them there. Psalm 51:5. All biblical citations are from the New American Standard Bible. John Newton, “Letter IX,” The Works of John Newton (London, 1820), p. 182. Charles H. Spurgeon, “Infant Salvation” A sermon preached September 29, 1861. Metropolitan Tabernacle Pulpit (London, 1861), p. 505. R. Albert Mohler, Jr. is President and Professor of Christian Theology. now the question is: what is the age cut off? @Tereza Crump aka MyTreasuredCreationsNo one knows, not worth trying to guess. But I do know this, God will be just. Thank you for this post!! This very question: "Do Infants who Die Go to Heaven?" has been in the back of my mind for a long time. It feels great to finally have some answers. Thank you Jesus! I don't believe it is so much of an age cut off but it's probably, more importantly the age when a child can discern right from wrong. Just my opinion.